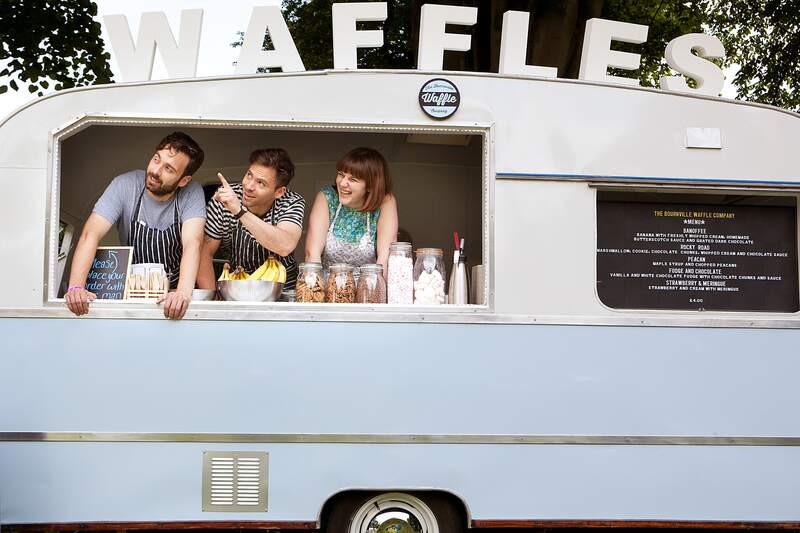 The Bournville Waffle Company was founded by Jenny and Des in 2013. Since then they have traded at many of the UK’s best festivals and events, selling waffles with unusual toppings from their lovingly restored and converted Mustang caravan. They are available for festivals, street food events and private hire. All the waffles are baked fresh to order, filling the air with an irresistible smell! Their menu is playful and creative, they offer a dessert that is unlike any other! They are all about serving their customers something new and different, providing them with a unique dining experience. They wanted their trailer to look as good as their waffles, so they came up with the idea of converting an old caravan. It wasn’t the easiest of tasks but they absolutely love the result. They have now converted a second caravan and also have a gazebo for those events when the caravan won't fit. Most weekends you can find them trading at music festivals, food festivals, street food events, weddings and corporate events. No event is too big or too small for Bournville Waffle Company, book them here on Feast It for your next event!